Acute viral rhinopharyngitis, or acute coryza, known as an upper respiratory virus, or commonly called a cold, is defined as a contagious, viral infectious disease of the upper respiratory system, primarily caused by rhinoviruses (group of viruses which live in the nasal passage) or the less common cold viruses known as coronaviruses, adenovirus and respiratory syncytial virus which produce mild infections in adults but can lead to severe lower respiratory tract infections in young children. The cold is the most common infectious disease in humans causing billions of illnesses worldwide. Collectively, colds, influenza, and other infections with similar symptoms are included in the diagnosis of influenza-like illness. 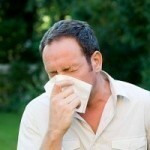 The common cold is a self-limiting illness caused by any 1 of more than 200 viruses. The common cold comes with mild symptoms that can last up to 10 days unlike influenza that has more severe symptoms including fever. Symptoms include runny nose, sneezing, congestion, headache, sore throat and cough, and are usually treatable by over-the-counter medications. Bacterial infections of the middle ear or sinuses can be caused from a cold and will require treatment with antibiotics. High fever, significantly swollen glands, severe sinus pain, and a cough that produces mucus may indicate a complication or more serious illness requiring a visit to the doctor. Cold viruses are usually transmitted through direct contact or from objects that have been contaminated by someone with the virus. The National Institute of Allergy and Infectious Diseases state that transmission can also occur from inhaling drops of mucus full of cold germs from the air. Zinc lozenges – zinc is an essential mineral found in the majority of cells. Zinc helps the body’s resistance to infection and tissue repairs due to its antioxidant effects. Shellfish, red meats, nuts, beans and milk are natural sources of zinc. Some studies show that zinc decreases the duration of colds. Lozenges can be taken every 2-4 hours for up to 5 days. Garlic – Garlic is a broad spectrum antibiotic with powerful antibacterial properties and other compounds beneficial to a healthy immune system. Garlic works best as a cold preventative or when taken at the first sign of a cold. Vitamin C – Vitamin C taken in large doses help to reduce the duration of a cold, though it cannot prevent it. Echinacea – The herb Echinacea purpurea is a popular herbal cold treatment. Despite prior indecisiveness new research confirms that Echinacea can prevent colds as well as limit their duration. Mix 15 to 20 drops of an Echinacea tincture with warm water four or five times a day (or as directed on the bottle). Chicken soup – advocates of hot chicken soup say it has healing properties; one theory says it may help soothe inflammation whilst other speculate that the steam helps in clearing congestion when inhaled. Ginseng – the New York Times wrote that “Canadian researchers tested North American ginseng extract against a placebo and found that it had a small but significant effect in reducing the number and intensity of colds”. Golden Seal – is a popular herb that stimulates the secretion and flow of bile, and can also be used as an expectorant. It also has strong activity against a variety of bacteria, yeast, and fungi, such as E. coli and Candida. Nasal rinsing – Popular research showed that children who rinsed with a saline nasal wash six times a day had an improvement in cold symptoms and fewer recurrences. Frequent intake of fluids can help to break up congestion. Drinking water or juice will prevent dehydration and moisten the throat. Fluids can include water, sports drinks, herbal teas, fruit drinks, or ginger ale. Gargling with salt water can also help in soothing the throat. Steam may ease congestion and drippy nose by holding the head over a pot of boiling water and breathing through the nose.